Oliver Hynd handed Great Britain their sixth swimming gold of Paralympics 2012 with a brilliant performance in the SM8 200m individual medley. The 17-year-old was more than four seconds behind France's Charles Rozoy after the first 50m, but had the lead by the time of the breaststroke leg and maintained his advantage to the finish. "I was really happy with that race," he told BBC Radio 5 live. "I also achieved a personal best which is great." Hynd, who has also won silver and bronze at these Games, clocked a European record time of two minutes 24.63 seconds. Wang Jiachao of China touched home in second and Maurice Deelen of the Netherlands finished in the bronze position. Hynd's brother, Sam, came fourth. Charlotte Henshaw came agonisingly close to adding a seventh swimming gold for Britain. The Mansfield swimmer was pipped to the SB6 100m breaststroke title by three-hundredths of a second by Ukraine's Viktoriia Savtsova, who set a new Paralympic record. Henshaw's team-mate Elizabeth Johnson held on for bronze. Louise Watkin also missed out on gold by fractions. The 20-year-old, who trains in Salford, was beaten to the S9 50m freestyle title by China's Lin Ping, who touched home less than a tenth quicker. Elsewhere, fellow Briton Rob Welbourn took bronze in the men's S10 400m freestyle. The 25-year-old Chesterfield swimmer, who won relay gold in Athens and Beijing, had the lead, but could not maintain the pace over the final 200m, with American Ian Silverman powering through to take gold while Canada's Benoit Huot clinched silver. 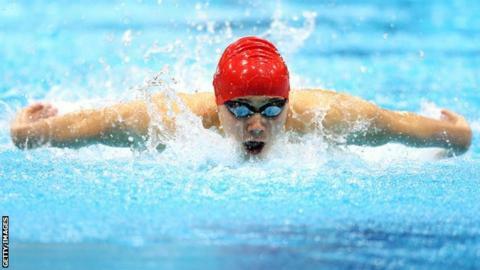 Chertsey teenager Hannah Russell, 16, won her third medal of the Paralympics - a bronze in the S12 100m backstroke. Russia's Oxana Savchenko dominated in the final 50m, winning gold with a new world record time.